Good news! You don't have to use the cloud to do mobile file syncing! As part of our jobs at TechTarget, Brian and I travel around the country talking about the consumerization of IT. One of the subjects that's always likely to bring up confusion is mobile file syncing and the cloud. As part of our jobs at TechTarget, Brian and I travel around the country talking about the consumerization of IT. One of the subjects that’s always likely to bring up confusion is mobile file syncing and the cloud. In the show, we like to mention that mobile file syncing is an easy win when it comes to dealing with consumerization and enabling mobile productivity. Why? With any mobile device, your users can already access email and web apps and such. But if users want to access files on a network drive or SharePoint or anything like that, then they’re out of luck, since there’s no way to do that automatically from iOS or Android. What do users do? In a familiar story, it’s hello Dropbox! 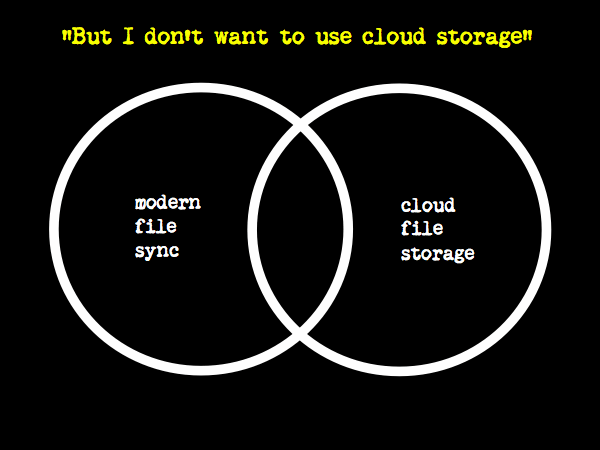 Or Box, or Google drive, or any one of the dozens (if not hundreds) of consumer cloud file syncing services. And then all that enterprise data ends up in the cloud, with who knows what level of security. Of course for a while now there have been many products intended to be “Dropbox for the Enterprise,” providing mobile file syncing, except with all manner of security controls. Many of these have options like password policies, remote wipe, higher levels of encryption, and sharing controls. At this point, often someone will object, saying, “Enterprise mobile file syncing sounds fine, but we don’t want to move our files to the cloud.” It’s understandable why somebody might think this, because some of the most prominent mobile file syncing products like Dropbox do utilize cloud storage. But this objection to cloud storage is completely fine, because many of these enterprise-oriented products can connect mobile devices to existing on-premises file servers and SharePoint, and even do desktop syncing. There are some other cool things going on in this space, too. As we’ve covered in the past, more and more file sync products are starting to come with built-in document editing capabilities. This is useful because now users don’t have to shuffle documents back and forth to other apps to get their work done—everything can stay protected in the corporate app, regardless of whether any other enterprise mobility management tools are involved. Can cloud file syncing replace backup solutions? +1 on "vendors vigorously nodding heads in agreement" list. We're definitely seeing evidence of this with many of the larger companies we are talking with about DataNow. Even if companies can get past the security discomfort of moving to the cloud, the reality is that files are stored in so many disparate places in a large enterprise that it's often simply not practical to move. The other big eye-opener has been that while the mobile use case is the sexier scenario, more user-friendly syncing to existing storage yields huge value with the traditional base of Windows PCs. There are tons of companies that have seen a dramatic shift to laptops over the last 5 years or so. Users are saying FUIT (Â© Brian Madden) to VPNs and file shares and storing files locally. We all do it. Having user data spread across 50-100k laptops makes OS migrations, hardware refresh, or just recovering users from day-to-day device failures a nightmare. We are starting to see customers do some interesting things like deploy DataNow to their Windows devices, and then use Environment Manager to set up local folder direction into DataNow. So users can go about their business and save files wherever they want, but everything gets synced over SSL in the background to file servers - from which it can then be easily deployed to a new machine. I struggle a bit with the need for mobile sync for files. Cell connectivity is pretty well available everywhere now, so it's a rare circumstance where a user needs to get at documents from a smartphone in an unexpected offline scenario. So, unless the smartphone is well managed and the EFSS solution does encryption at rest on the smartphone, it's safer provide real-time connectivity to an EFSS while disabling caching. That typically provides users with the convenience factor they are looking for, without placing sensititve corporate data on unsecured end points. I should add that disabling automatic sync to mobile devices wouldn't preclude the user from manually downloading a copy of a document for offline use. The user still enjoys the convenience of mobile file access through a native app, but needs to plan ahead if they want to access documents offline. I think that's generally a fair compromise. We at Armor5 have a different take on the entire providing access to files on mobile device and still providing the required security to the enterprise. We have a blog post just for this topic, which is quite a easy read.